As it had hinted on its Twitter feed a few days ago, and we heard the first rumours about back in April, Asus has launched its first gaming oriented smartphone under its Republic of Gamers brand. The new phone wields impressive specifications with highlights including the 90Hz AMOLED display with 1ms response time, the use of the "world's fastest" speed-binned 2.96GHz octa-core Qualcomm Snapdragon 845 Mobile Platform, and the GameCool 3D vapour-chamber cooling system with detachable AeroActive Cooler, plus the use of programmable ultrasonic AirTriggers for game control. The ROG Phone is claimed to combine the best mobile processor with a silky-smooth HDR display. Inside you will find a 'cherry-picked' SoC, the fastest speed-binned 2.96GHz octa-core Snapdragon 845 SoCs available from Qualcomm (about 200MHz faster than stock). This powerful platform combines eight Kryo CPU cores and Adreno 630 graphics providing ample horsepower for the latest games. The processor is backed by 8GB LPDDR4X RAM, and the system uses 128GB or 512GB UFS 2.1 storage. With such a powerful and fast processor, even a mobile one, there can be issues with thermal throttling when they are put under stress for longer durations - like when indulging in intense 3D gaming. Asus has built-in its own special GameCool system, which improves thermals with a copper heat spreader and 3D vapour chamber, efficiently transferring heat away from the SoC and into the body. In some of the photos you will see an additional cooler 'clamped' onto the phone body - this is the included AeroActive Cooler accessory which blows air over the phone back to accelerate heat dissipation. It delivers improved sustained performance during "extremely strenuous gaming sessions," says Asus. The screen sounds like a very high quality one. It offers a 6-inch diagonal with 2160x1080 pixels (18:9). Asus has picked an OLED display with 90Hz refresh rate with 1ms pixel response time. Furthermore, it offers good colour reproduction - 108.6 per cent DCI-P3 colour gamut and 10000:1 contrast ratio, plus HDR visuals. The screen offers 10-point multi-touch (supports Glove Touch). Protecting the screen Asus leverages Corning Gorilla Glass. 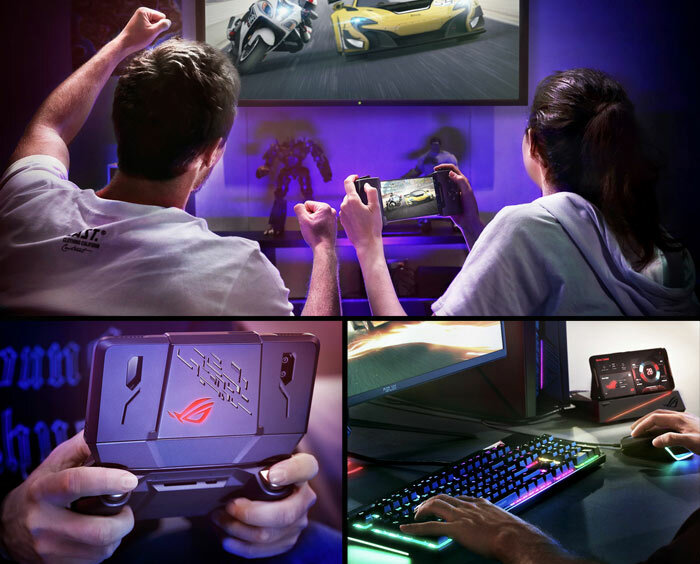 Other innovations present in the RoG Phone include the ports and range of controls available, especially for gamers. Most games are played in landscape mode, so Asus has positioned additional side-mounted I/O which can be connected up yet not get in your way when gaming. The side USB-C port supports the accessories like the AeroActive Cooler, the TwinView Dock, and the Gamevice controller with WiGig Dock. You can fast charge with any of the USB Type C ports, as you wish. Another boon for gamers might be the dedicated ultrasonic buttons, referred to as the AirTriggers . They help you interact in the game without touching the screen. Asus says you can also set up these triggers outside of games for apps, tasks and macros. Other than gaming another popular task for smartphones is photography. 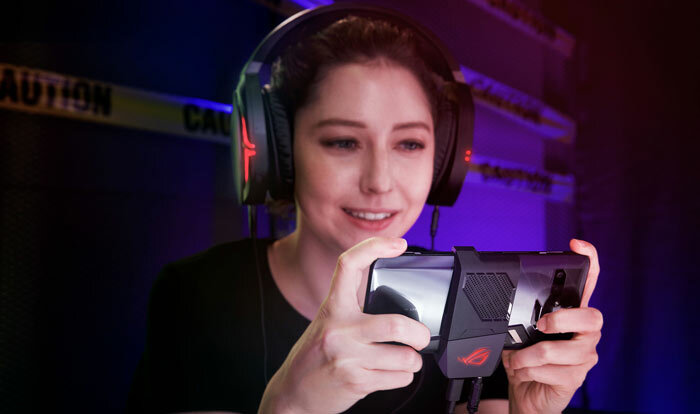 Asus has kitted out the RoG Phone with a 12MP rear primary shooter, while a secondary camera takes 8MP wide-angle shots with a 120° field of view. An 8MP selfie cam is embedded in the front top bezel. Also on the front are two speakers powered by a smart amp. This phone supports all the modern connectivity options you would expect such as 802.11ac Wi-Fi with 2x2 MIMO, LTE, BT5.0, and NFC. A standard 3.5mm headphone jack is present. A plethora of sensors are installed in this phone, such as an accelerometer, e-compass, proximity sensor, Hall sensor, ambient-light sensor, fingerprint sensor, and a gyroscope. It features GPS, aGPS, Glonass, and BeiDou, too. Of course this isn't a very slim and light phone but it sounds acceptable, considering the power under the hood, and that it packs a 4,000mAh battery too. The smartphone measures 158.8 x 76.2 x 8.6mm and weighs in at 200g. If you are interested in the Asus RoG Phone you will have to wait until 'this summer' for phones / bundles to appear. Putting the meat on the bones, here is a video runthrough of the Asus RoG Phone's features. A beastly 7% overclock!!! I guess the more significant achievement is stopping the SOC from down-clocking when it gets hot. It looks like they've put some effort into the controllers and accessories. However, one of the main things I want to see with a new Android phone is a promise about future OS updates. Big battery with a cooling system to prolong it's life and prevent throttling is nice. Tie in a nice screen and this is an attractive device. I know there's always something around the corner but it seems mobile SOCs develop so quickly (http://hexus.net/tech/news/cpu/118742-arm-launches-laptop-class-cortex-a76-cpu/) that the chip binning seems a bit pointless. However, one of the main things I want to see with a new Android phone is a promise about future OS updates. That's the question, how good are they at providing timely Android builds considering this is their first phone. I'm not good with phone specs but is the 4,000mAh battery good enough? I usually play 3-4 hours a day. I'm really digging the accessories.